DWNTWN's Only Pop-Up Gallery for Basel on the Big Screen! A-B(o)MB Drops on Black Friday! Artoconecto presents a VIP Sneak Preview of 'A-B(o)MB II (Art Basel (off) Miami Beach): The Fallout, a juried show of emerging national and international artists, on Friday, November 27, 2009, from 6-10PM, featuring a live performance by selected artist Gregorio Boscan, who will premiere ACQUA a site specific installation designed for the exhibition. There will be also be complimentary cocktails and hors d’oeuvres kindly provided by some of the hottest new spots in Downtown Miami. This will be an RSVP-only sneak preview event, in anticipation of the official Opening Reception, on November 28th, from 7-11PM, which will also feature the opening of the Oolite Visual Arts Showcase, Miami artists under 30. A-B(o)MB II will take place at the legendary Macy’s corner, 2 West Flagler Street NW, Miami, Florida, with the generous support of Macy’s and DWNTWN, and will present an exciting calendar of arts and cultural events that will run through the month of December in the heart of Downtown Miami. 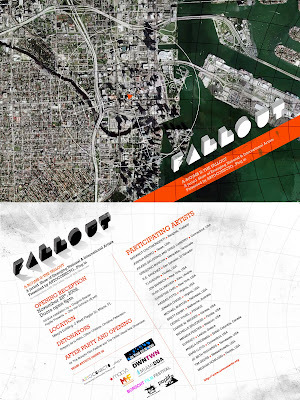 'The Fallout' is Artoconecto's first satellite show in conjunction with Basel/Miami, and will be held at Macy's/Burdine's historic Flagler Street during Basel week. The jury includes artists Gregory de la Haba (NYC), Clifton Childree (Miami), and Christina Pettersson (Sweden/Miami), giving artists a true voice in the selection process. This will be our second show in Miami, after over a dozen shows in Washington, DC, where Artoconecto was a National Endowment for the Arts Grantee. Artoconecto was awarded a grant from DWNTWN (Downtown Development Authority) for A-B(o)MB II: The Fallout, after receiving grants this year from Miami-Dade Cultural Affairs, for KIDSART, an arts program for children, and from the Miami Beach Chamber of Commerce for the Borscht Film Festival. According to Executive Director Alexandra Rangel, "Miami’s Downtown has evolved from a bustling business core to an international entertainment destination. Casual and upscale dining, lounges, nightclubs and music venues have created an excitement around Flagler Street, Downtown’s traditional ‘Main Street’. Arts venues are the latest addition, adding a cultural layer to an already thriving mosaic. 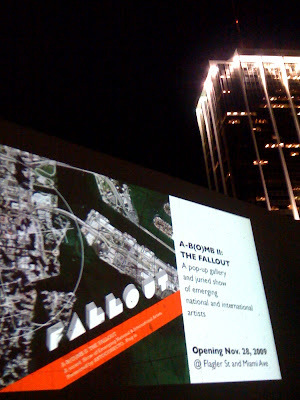 ‘A-B(o)MB II: The Fallout’ will present the best that Downtown has to offer through a month-long celebration of the arts." For more information or to RSVP, please contact Alexandra Rangel at Artoconecto@gmail.com or call at 786-246-2052. ABOMB II: THE FALLOUT, will explore the dialogue that continues to evolve around the perception of place-internally, externally, and wherever the two intersect. Today's 'American Dream' has its own surreal waking life in art. With its dangerously twisting highways, the American narrative seems to have been building to a booming crescendo, only to end with a flatliner. Or as Texas-born sculptor Joel Ross famously said, "Everything I’m thinking about right now falls under an umbrella of examining a f**ked up place called America." In Miami, a city perhaps more truly American than any other, where the curvilinear skyscrapers with ocean views and thirty-foot balconies mock the more earthbound among us, we are challenged every day to make art out of America. The big question is, will there be a real narrative, one that is pieced together from those bold enough to risk poking their fingers into the whirling machine to remove some tiny, gritty granules of truth?